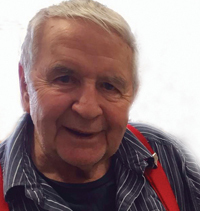 DAVIS – Donald William Davis of Brooks passed away peacefully at Sunrise Garden in Brooks on February 4th, 2019 at the age of 91 years surrounded by his loved ones. Born in Lethbridge, Alberta on January 5, 1928 he married Elaine on March 3rd, 1948 .They resided in Lethbridge, moving to Calgary, Regina and to Medicine Hat in 1969, where they resided until 1982. From Medicine Hat they moved to Duchess then Peachland, BC and finally to Brooks in 2005. Don will be remembered for his love of his family. He loved his time in Mesa with his wife Elaine. Don loved spending time at the lake boating, water skiing and spending time outdoors. His sense of humour and laughter was incredible. Don had a successful sales career and then ventured out as an entrepreneur in 1969 by buying a Pepsi Cola distribution and never looked back. Don is predeceased by his wife Elaine, son Troy Ryder Davis, granddaughter Tammy and his parents Queenie and Lloyd Davis. Don is survived by his children, grandchildren and great grandchildren – Randi Lee (Don) Mark – Randon (Jennifer)Mark / Cole (Brenda) Davis – Damyan (Julie) Davis – Hunter & Haris, Channing (Janene) Davis – Peyton, Cruz & Maxx, Nathan (Nichole) Davis – Nixon & Nash / Heather Davis (Keith Finkbeiner) – Travis Finkbeiner – Zaylynn, Dane (Amanda) Finkbeiner – Mia / Clayton (Nelma) Davis – Dylan (Brianne) Davis / Troy’s daughter’s – Tanashia (Aaron) Petrick – Ryder and Tammy’s sons Tyrece & Trey. Celebration of Life to be held Friday, February 8, 2019 at 2:00PM at Thom’s Funeral Home and Reception Centre. Pastor Joel Goodnough Officiating. In memory of Donald, memorial tributes may be made to the Alzheimer Society of Alberta by visiting the memorial page setup for Donald at www.thomsfuneralhome.com. For further information, to leave a message of condolence or to light a candle in memory of Don, please visit www.thomsfuneralhome.com or call us at (403) 501-1010.